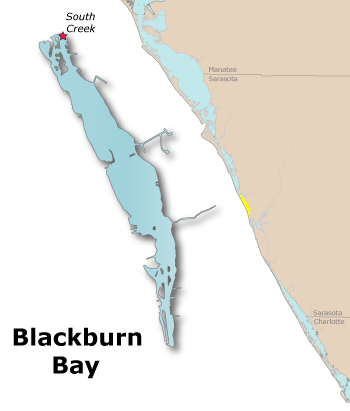 The overall health of Blackburn Bay has remained in good condition with all water quality parameters below their associated target levels. However, the biotic indicator, seagrass, has continued to decrease. Water quality: All three water quality indicators (chlorophyll a, nitrogen, and phosphorus) were rated as pass (below the threshold).The mean for chlorophyll a was calculated as an arithmetic mean and the means for nitrogen and phosphorus were calculated as geometric means (Numeric Nutrient Criteria Recommendations).The mean chlorophyll a level (0.0051 mg/l) in Blackburn Bay has decreased and was scored as “Excellent” (scored as good in 2010), below the target (0.006 mg/l) and threshold (0.0082 mg/l) levels. The mean nitrogen level (0.3513 mg/l) has slightly decreased and was scored as excellent, below the target (0.360 mg/l) and threshold (0.430 mg/l) levels. The mean phosphorus level (0.0556 mg/l) has remained constant and was also scored as excellent, below the target (0.170 mg/l) and threshold (0.210 mg/l) levels. Biotic Indicator: The total acreage of seagrass has remained relatively constant since 1988 but in 2010 the mean level of seagrass (323 acres) was still below the target of 447 acres.